“It is the best aid during my 30 years as a veterinarian. The cameras document what the eye does not see, and an objective scientific assessment is obtained. It’s a huge help and it helps me as a veterinarian to think and see new critical eyes.” Dr. Lotta Månsby, owner of Ale Djursjukhus since 1994 with her husband Dr. Mikael Svedberg, has had a great deal of involvement with health diagnostics in movement analysis of equines and is particularly fond of her Qualisys equipment. Dr. Lotta Månsby is the owner of Ale Djursjukhus and started the business with her husband Dr. Mikael Svedberg. Lotta is assisted by veterinarian Marie Patriksson the veterinarian at Ale Djursjukhus who manages the system. 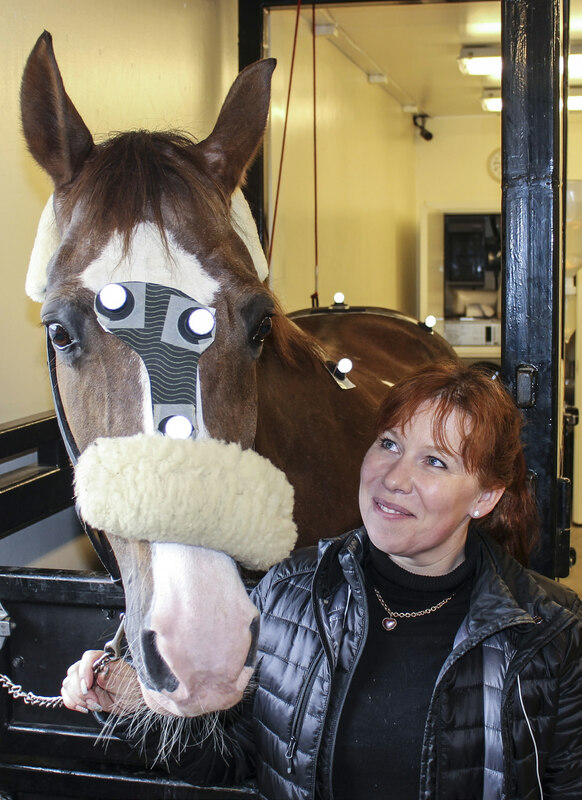 The Qualisys optical motion capture system is becoming increasingly well-known in the horse industry. After a visit with the entire staff at Swedish University of Agricultural Sciences (SLU) two years ago, and soon after, purchased a Qualisys system for themselves. Ale Djursjukhus is one of the first clinics of its kind with this high-performance motion analysis system. In one case, a seventeen-year-old horse, Tessan, had been studied by Jessica Nordin from Vena Dressyrcenter. The horse has had a chronic problem in the foot’s radial bone area in the past. She came to the clinic because the owner had seen a similar injury pattern previously and thought it might be the same problem again. Jessica believed it was worth paying a little extra to get a precise picture of the situation. As an electronics and computer engineer, she also wanted to see how the system worked in practice, and in the end, she hoped to get her horse back on track again. Jessica described Tessan as a good ride but very difficult to handle. In preparation for the test, reflective markers were attached to the horse’s head, withers and pelvis before the test began. First, she trotted straight ahead. The cameras captured everything and made it easier to see if the ailment was in the landing or mid-stride as the horse shows a possible deviation from normal gait. Lotta applied anesthesia to see if there would be any difference after that. From the captured results, the team could see the asymmetry which surprised them—Tessan was unhealthy on her right forefoot, though she had previously experienced and was treated for an injury on the left forefoot. It’s an investment, but the system helps to get a faster diagnosis because you can verify motion immediately.